Another interesting piece today from Macleans. And perhaps only highlighting something that I will continue to emphasize. 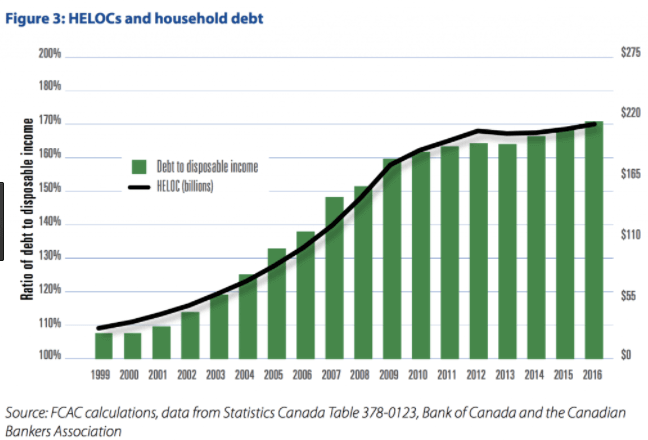 Canada is mired in a debt binge. Recent data highlights Canada has accumulated more private debt in the past 5 years than any other advanced economy. Record low interest rates are allowing borrowers to take on heaping amounts of debt (debt to income has increased to 169%) creating an inevitable problem when interest rates begin to rise. Scott Terrio, a debt consultant, says the situation is a full blown “extend and pretend” meaning borrowers are just continuously refinancing or taking on more and more debt in order to sustain their lifestyle. Since the year 2000, HELOC debt has grown from $35 billion to $211 billion in 2016. Last year, Canadians used $11.6 billion in HELOC’s to pay down existing debt. In other words, they’re taking on new loans to pay down existing loans. Akin to a Ponzi scheme, more new loans are required to keep the game going. If you haven’t read the book ‘Manias, Panics, and Crashes‘ by Charles Kindelberger I highly recommend it. The famed economist and historian, highlights the role of credit in every boom. 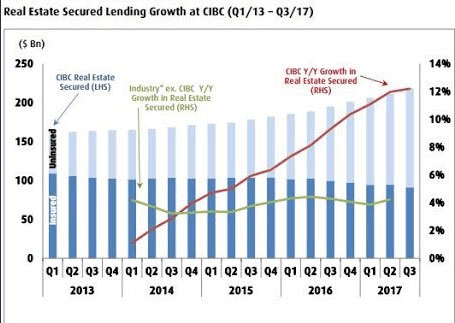 Well, here’s CIBC where uninsured mortgage growth in the past year is nearly triple that of any other major bank. Banks are completely out of control, handing out more and more loans and further indebting Canadians. It seems as if they don’t even care if it’s secured against Real Estate anymore. 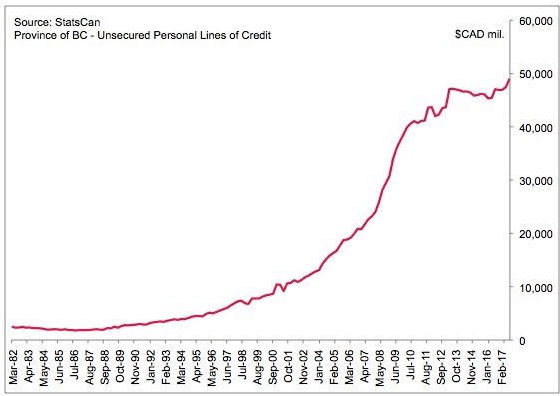 Here’s unsecured personal lines of credit in BC. Unsecured personal lines of credit in BC.